Nokia 1 to 10 - a Nokia for everyone. 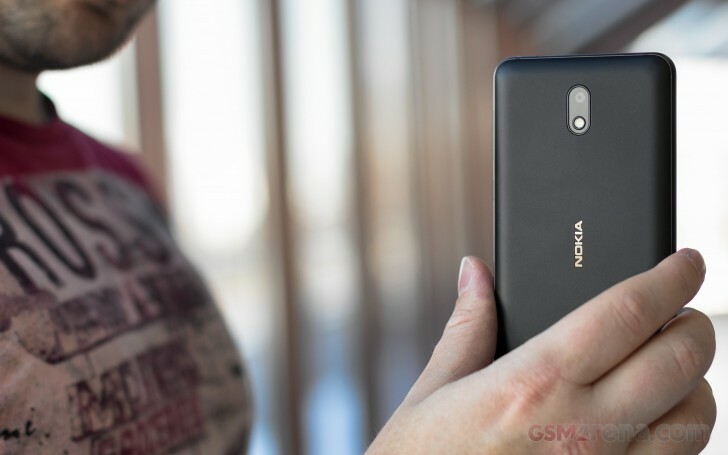 Well, we're getting there - after the famed brand's return with the Nokia 6 in early 2017, the 5 and 3 followed, and then the flagship Nokia 8 came to be. The 7 showed up later filling one of the gaps, though not everywhere in the world - like the others, actually. 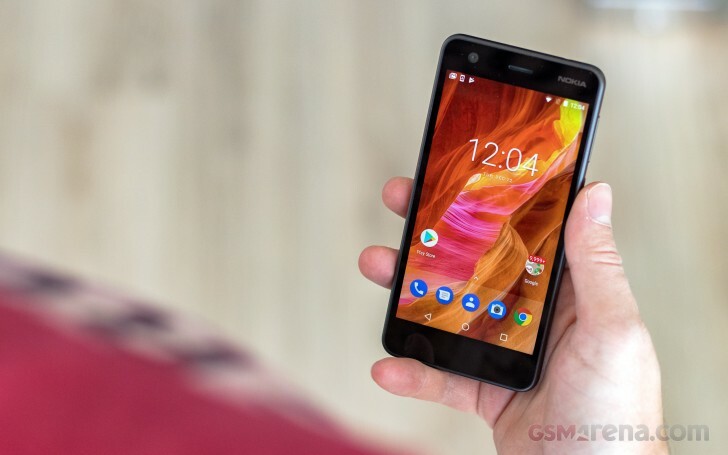 The portfolio's expansion continues into the entry-level segment with the Nokia 2 - a budget model if there ever was one, priced around the $100 mark. What that gets you in Nokia world is a 5-inch 720p display - pretty great at this price point if you ask us. 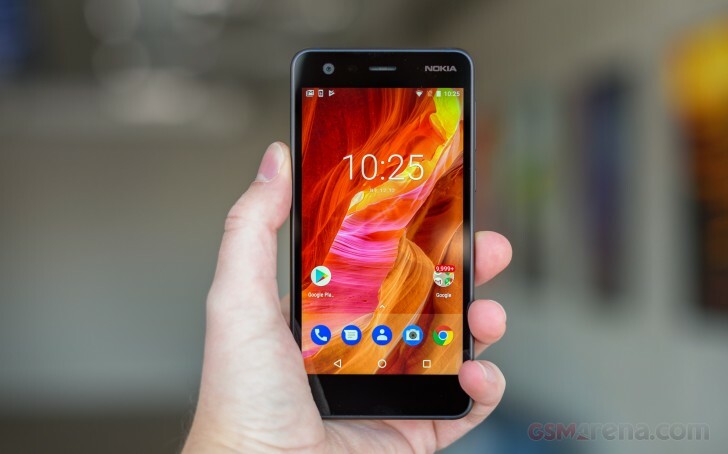 Going by the numbers, it could be the same as the one on the Nokia 3, so thumbs up to Nokia for not digging up a qHD panel (small 'q' - 540x960px) long forgotten in some distant warehouse. It's covered with Gorilla Glass 3, so there's no complaints about that either. Where things start looking gloomy is the chipset - the Snapdragon 212 is an old dog, a minor upgrade to the 210, neither of which is particularly quick. And that's just us being polite. A single gigabyte of RAM and 8GB of storage further reinforce the feeling we're looking at a smartwatch specsheet. Smartwatches don't typically have cameras, and we certainly haven't heard of ones with two shooters. The Nokia 2 is no wearable and does have a pair - an 8MP camera on the back, and a 5MP front-facing unit. Nothing fancy, obviously. What it lacks in oomph, the Nokia 2 makes up for in battery - a 4,100mAh power pack promises plenty of on time, 2 days Nokia says. We'll see about that. There are goodies you won't find on most flagships though - like the dedicated microSD slot, whether the Nokia 2 is single or dual SIM. There's an FM radio receiver too, beat that, Pixel 2! There's no Wi-Fi ac, LTE download speeds are limited to 150Mbps, and the charging port is microUSB, but should you really expect more in this price segment? There's a headphone jack, after all, if we haven't mentioned a Pixel 2 recently for no apparent reason, ahem. 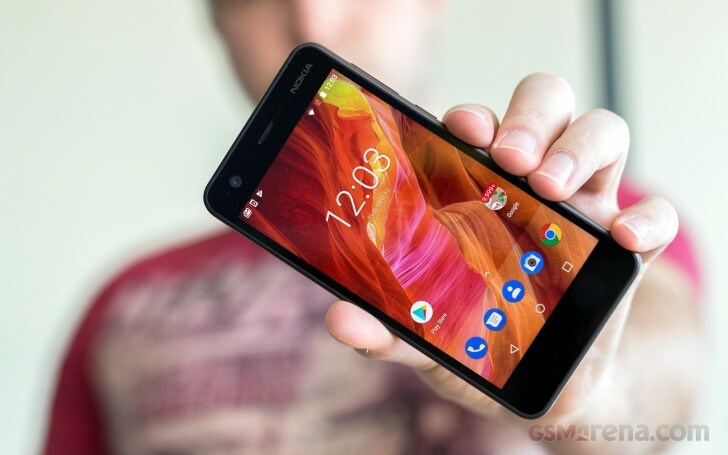 Now, if we weren't thrilled with the Nokia 3's performance when we had it over for review, what does that say about the humble 2? Nothing, not yet at least - we'll be evaluating it on its own merits. Let's get it out of its box first. 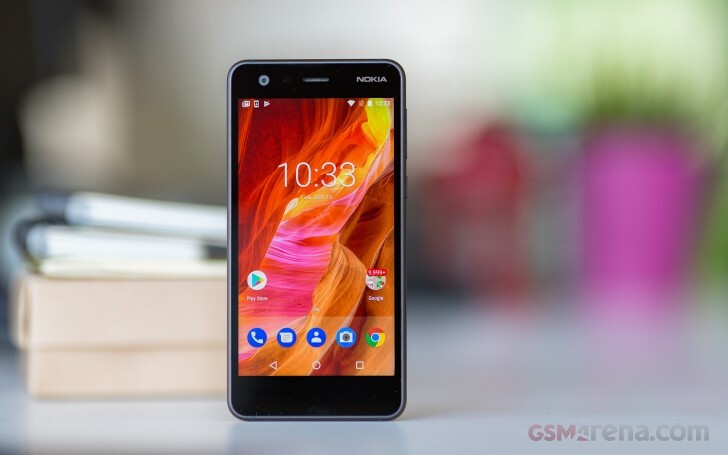 The Nokia 2 comes in an unassuming small cardboard box with the phone printed on top, in a 'connecting people' context, of course. Jokes aside, there's everything to get you started: a 5V/2A charger, a USB cable, and even a basic headset. 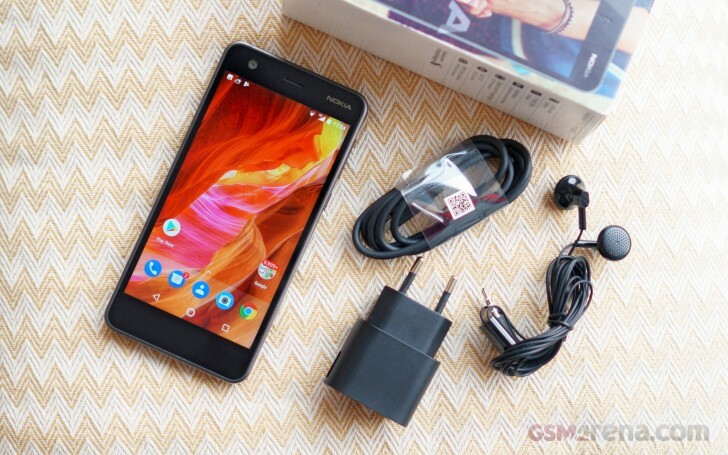 The Nokia 2 is a rather unassuming, but well built phone. There's a metal frame all around it, and despite the color scheme being called Pewter/Black, the frame is not made of pewter, but is aluminum instead. It feels nicely cold and expensive, that latter enhanced by the non-black pewter color. The back, on the other hand, is very much black and unmistakably plastic. That's not a bad thing in and of itself - we've repeatedly insisted that there's nothing wrong with plastic on a phone. This one in particular does tend to smudge and is not very easy to clean, but the prints aren't all that visible. One good thing about the back cover is that it's removable - yay. Only the battery isn't - bummer. Still, a removable cover can be easily replaced if broken or all scratched up. Another positive side of this approach is that you don't need a pin to insert a SIM card or a memory card - we had a hundred pins at the office at one time (thanks, Victor! ), but lately it's been a quest finding one - point being pins get lost. There's a Nokia logo in the middle of the back cover, a shiny recessed one. A cutout in the panel lets the camera take a peek at the world, its LED flash nearby. The loudspeaker is down in the right corner, a placement we've come to see less often. There's a small pimple that prevents it from being muffled when the phone is lying flat on a hard surface. Pop the cover off, and you'll see a nano SIM slot on either side of the phone. The left one is a simple slide in type, while the right one is a push-to-insert, push-to-eject affair. The rationale likely is that the right SIM slot is underneath the microSD slot, so the push action saves you the hassle of having to remove the memory card to get at the SIM card. Oh, yes, you can have all three cards in at the same time, the microSD gets its own dedicated slot. Perhaps you got overly excited hearing of a removable back cover thinking you can swap out the battery too - we know we did. Sadly, that's not the case - you have at least a dozen screws of two different sizes standing in your way - not impossible, just not something you'd be doing on a daily basis. Snap the cover back on and flip the phone to see another Nokia logo greet you from the top right corner above the 5-inch display. The earpiece is in the middle, duh, and right next to it are the proximity and ambient light sensors, with the 5MP front camera further to the left. Unfortunately, there's no notification LED. There's nothing in the bottom bezel, at least nothing immediately usable on the front - there's certainly stuff inside. So yes, there's plenty of meat around the display - the Nokia 2 makes no bold full screen promises and is a classic chunky bar. The power button and the volume rocker are on the right side. Even if we tend to advocate for putting them on opposite sides, in this case the power button is below the volume rocker and the placement works much better than the reverse arrangement you'd find, say, on a Pixel 2 - that's a hat trick of things the Nokia 2 does better than the Pixel 2. On the bottom, you'll find the microUSB 2.0 port - apparently USB-C is still too expensive. Right next to it is the groove in the aluminum frame where you need to stick your fingernail to get the back cover off - neat. The primary mic gets its own dedicated pinhole. Another pinhole can be found on top, this one for the secondary mic. The 3.5mm jack is also here. 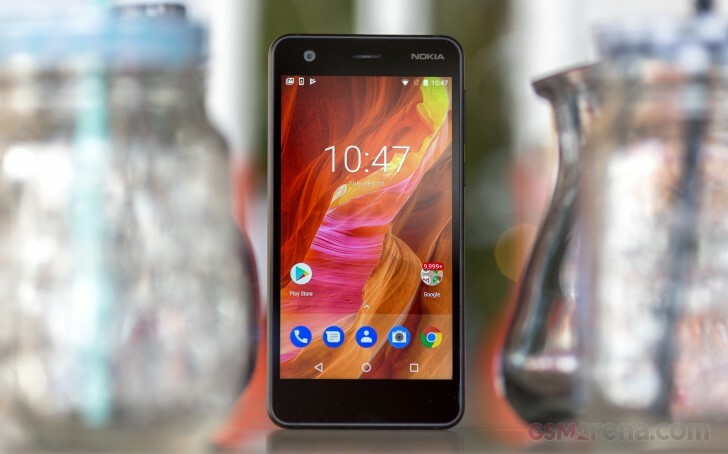 The Nokia 2 measures 143.5 x 71.3 x 9.3 mm which is a few millimeters taller and about a mil wider than the competing Redmis of the world - 4, 4A, and 5A. The Nokia is heavier than all of them too - its 161g are closer to the Redmi 4's 150g, while the As are in the 130-somethings. That said, the Nokia 2 doesn't really feel too heavy. Body: Aluminum frame, removable plastic back, Gorilla Glass 3 front. Display: 5.0" LTPS IPS LCD, 1,280x720px resolution, 294 ppi. Rear camera: 8MP, f/2.6 aperture, autofocus; LED flash; 720p video recording. Front camera: 5MP, f/2.6 aperture; fixed focus; 720p video recording. Chipset: Qualcomm Snapdragon 212: quad-core 1.3GHz Cortex-A7 CPU, Adreno 304 GPU. Memory: 1GB of RAM; 8GB of storage; dedicated microSD slot. Connectivity: Single SIM and dual SIM versions, market dependent; Cat. 4 LTE (150Mbps/50Mbps); microUSB 2.0; Wi-Fi b/g/n; GPS, GLONASS, BDS; no NFC; Bluetooth 4.1. Misc:FM radio, 3.5mm jack, back-firing single speaker.